Happiest Minds Technologies puts forward a unique blend of Testing Processes, Tools and Technology Expertise, and Domain Knowledge ensuring that the product is delivered without defects in an accelerated time frame. Our end-to-end functional testing services are set of matured test processes with in-house accelerators and industry-leading functional testing tools. We aim to shoulder the complete responsibility for all the testing activities of our customers. From creating an optimized test plan to providing prompt post production support, we at Happiest Minds Technologies, adopt a customer centric testing approach along with delivering continuous value improvement in our engagements. We ensure complete traceability from the business requirements to the test cases designed and executed for extensive test coverage. As an industry leader on functional testing, we provide extensive reporting with customized dashboards at regular intervals for you to be on top of the testing progress and defects. Document your business ecosystem, priorities and test environment. Define, Test, Measure, Report and Retest QA. Incorporate an adaptive test approach that captures changes during development. Test Automation: Leverage our test automation approach and in-built test automation frameworks to accelerate test cycles and reduce manual testing effort. Test Accelerators: Jump-start test automation efforts, ensuring quick ROI, wider automation coverage, and maximum reusability. We provide tool and technology agnostic framework, reusable object library, guidelines and best practices support desktop, web based, mobile applications and more. We automate the testing activities and streamline the automation processes across STLC. 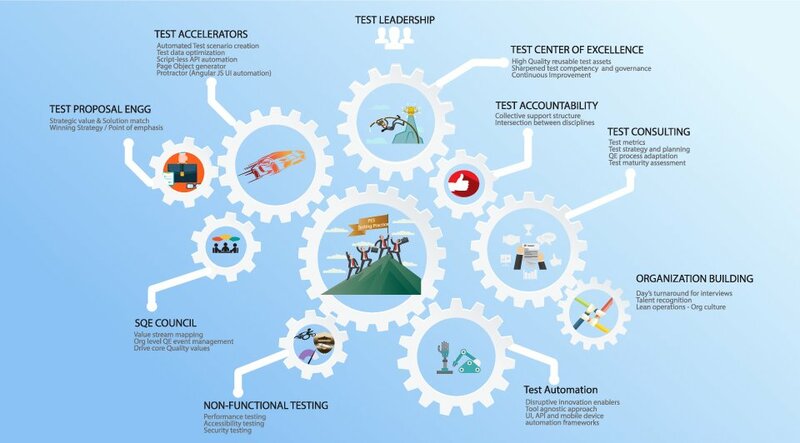 Test Center of Excellence: Centralized unit comprising testing processes, people, tools that operate as shared services in order to provide testing services with optimal benefits across the test organization. Test Advisory & Transformation: We help you assess your current testing practices and processes, based on which we implement a roadmap to improve on your time-to-market and cost of quality, keeping in mind your organizational and business goals.